While many will be celebrating the 4th of July, survivors of the 1 October shooting may experience PTSD during fireworks. "Even once you knew that it was gunshots, it sounded like fireworks," said survivor Heather Gooze. Safe-N-Sane fireworks go on sale Thursday morning in Las Vegas. Many survivors, including Gooze say they are feeling anxious. "Everyone is asking what's the best noise canceling headphones," she said. The Vegas Strong Resiliency Center is asking Las Vegas locals to be considerate of those affected by the 1 October shooting. “Many of those who were at the Route 91 festival have described the onset of the shooting as sounding like fireworks,” said Terri Keener, a licensed clinical social worker and Behavioral Health Coordinator at the Resiliency Center. “Over the July Fourth holiday, the sound of fireworks may be a startling reminder of that night for many survivors. Reactions could cause flashbacks, anxiety, and feelings of embarrassment about these reactions if they occur in front of others." 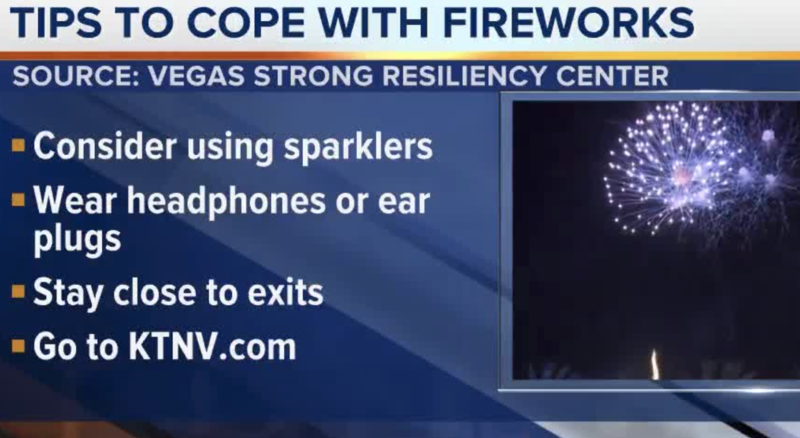 Those who were affected by the shooting are also encouraged to prepare for the potential impact of fireworks and reach out for support. Meanwhile, Dr. Megan Freeman, a licensed psychologist with the Nevada Department of Health and Human Services, asks family members to be "understanding, supportive, and flexible" during Independence Day celebrations. Recognize your triggers ahead of time. Talk with family and friends about how you might react or what is worrying to you. Make a plan for coping with a reaction. Engage others who support you and communicate to them when you are beginning to feel uncomfortable. Use noise canceling headphones or ear plugs. Consider using alternatives to typical fireworks such as sparklers. If you are going to a gathering, stay near exits and have a plan for coping with feelings of stress or anxiety that may occur. Try to calmly remove yourself from the situation by taking a short walk, getting a drink of water, or washing your hands. Take a time-out. Practice yoga, listen to music, meditate, get a massage, or read. Stepping back from the problem helps clear your head. Be physically active. Find an activity or sport that you interests you. Even short walks or dancing can help you feel good and maintain your health. Try some grounding techniques to connect you to the here and now. Focus on the details present in your surroundings or on neutral physical sensations. Count something that you notice such as trees, people with hats, or floor tiles. Notice the colors that you see, or the flavors that you taste. Talk to someone. Let others know when you are feeling overwhelmed and how they can help. Distract yourself. Use a personal device to listen to audiobooks, podcasts, or music. Connect with others. Visit a peaceful place or attend a support group. Spend time with someone who you trust and are comfortable with. Gooze, a bartender, plans on staying busy for the holiday. She believes that will help her cope.